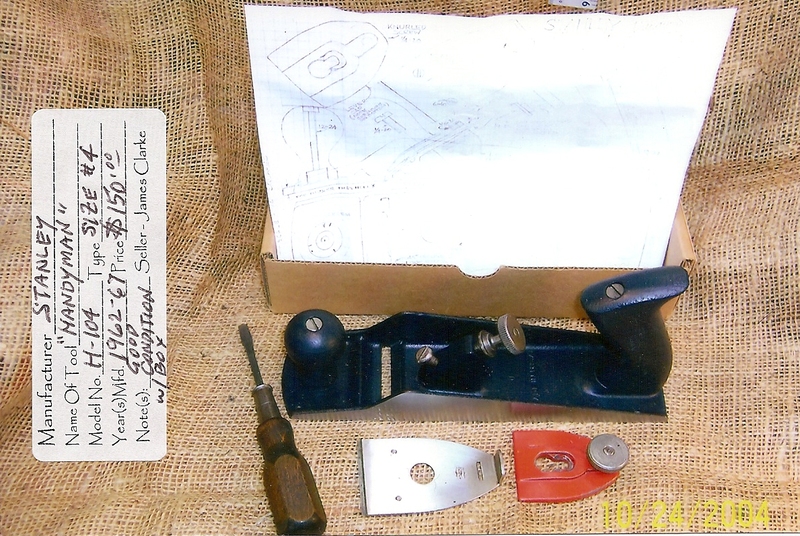 This post is about the Stanley Tool Company’s “Handyman” Bench Plane Model H-104 offered in 1962 as a low cost alternative to their many other higher priced offerings. The so-called “do-it-yourself” movement was well underway following WWII through the 50’s and early 60’s, but by this time demand for higher priced planes was significantly reduced and thus gave rise to the need for manufacturers to appeal to budget-minded buyers with low-cost alternatives. It was also apparent that do-it-yourselfers and the “handyman” didn’t require the top-end line of tools for household tasks. At this point it needs to be mentioned that Clarence Blanchard in his excellent publication “Fine Tool Journal”, Vol 53, No.2 Fall ’03, had a rather thorough coverage of this plane from the standpoint of how Stanley progressed the development from inception to production based on an actual production folder containing drawings and correspondence between various departments withing Stanley. This is recommended reading and can be found here: Stanley H104 Bench Plane Article by Clarence Blanchard. Of interest, it seems that the plan began as a Model No. 140, but then was changed to the Model No. H104. (It is believed that it started out as a higher-end offering!) What is clear, however, is that the H104 had a relatively short lifespan (4-5 years) when Stanley discontinued it on June 13, 1967 due to poor sales. (< 20,000 were likely ever made). This plane is ‘collectible’ and the most sought after Stanley “Handyman” low cost plane due to its low production numbers and unique features. Author’s appraisal — this is a very nice low-cost plane for casual (“Handyman”) service. The disposable blades can be sharpened or replaced as intended. 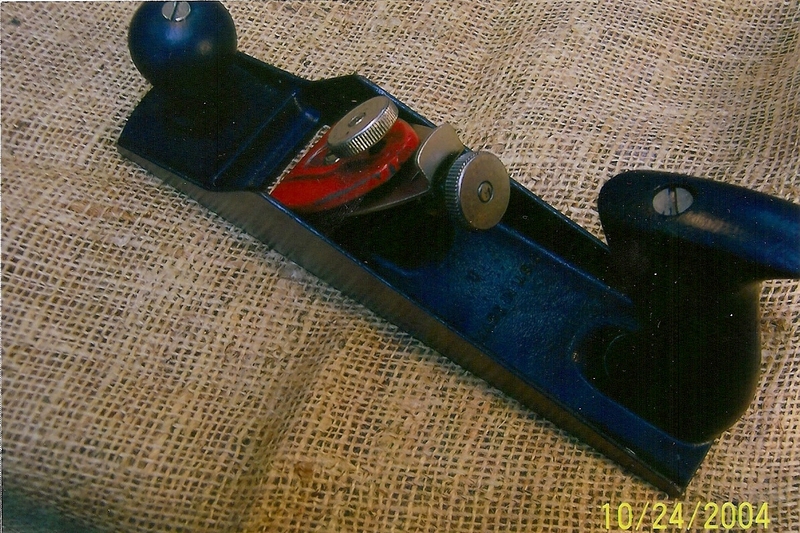 To make these planes easier to use and maintain, Stanley revived the disposable blade concept, at a reasonable price and called it the “Handyman ‘Ready-Edge’ Bench Plane.” How many were actually made is unknown (From Blanchard — Less than 20,000) since not everyone was of the “disposable” cutter ilk, although it did have its merits and thus more than likely had a serious following. The real appeal of this little brother to the “standard” line (maybe not so little at 10″ long) is the various design solutions used for cutter height and lateral adjustments — the nicely executing castings and machined parts. For a so-called low-cost tool, this was a keeper! The H104 is about the same size as the other No. 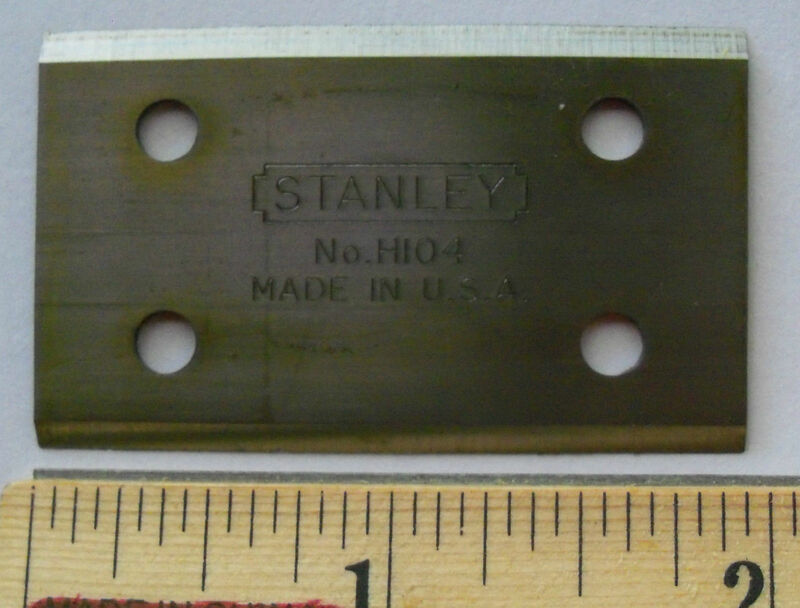 4 planes in Stanley’s many-fold lines, although slightly longer but much lighter in weight at 2 1/2 pounds versus 3 3/4+/-. Chatter must have been an issue with this plane as the uppermost tip (an area of about 1/8″ x 1/2″) of the slanted “tower” frog is the only part of the frog that comes into contact with the cap iron/blade assembly. This arrangement is only slightly stiffened by the attachment of the “Ready-Edge” blade to the cap iron that doubles as lateral adjuster and facilitates setting the depth of cut. It should also be noted that the cap iron is about the size of a credit card and only about twice as thick which is not a lot considering the minimal support provided for it. The disposable “standard” 25 degree bevel-angled “Ready-Edge” blade has two sharpened edges allowing it to be rotated and re-installed into position via two small (#6-40) pan head screws. This arrangement provides a narrow semi-adjustable cutting edge (reveal) between the cutter edge and the chip breaker (~1/32″-1/16″) and thus satisfactory for fine, medium or coarse shavings. When new the plane came with an extra blade in the box and additional blades could be purchased — similar to a shaving razor. A limited amount of sharpening was possible although apparently not expected by the “Handyman” population. Lateral adjustment was a simple to the point solution (compared to what was used on Bailey, Traut and Shade designs) utilizing a slot in the cap iron engaged by a shouldered machine screw. An interesting refinement is the key-hole slot in the lever cap — this shouldered/countersunk recess traps the head of the pan head screws to prevent creep/movement of the lever cap when the cutter depth adjustment is being made. 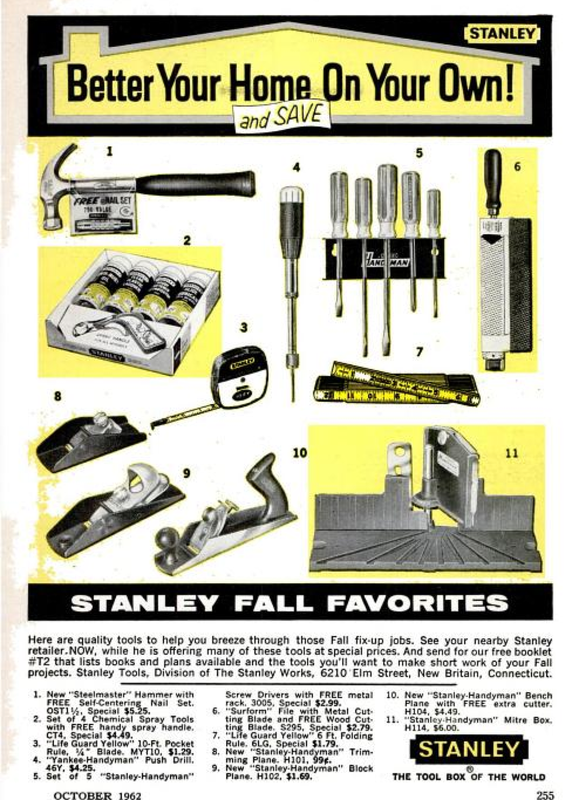 Stanley originally used a ‘key-hole’ design on their top of the line bench plane offerings, but then “patented” a new kidney shaped design around 1933 intended to eliminate creep. While none of these designs effectively eliminated creep the H104 design was pretty much fool-proof — when the lever cap was locked into place it could not move. The hardwood front knob and rear tote were painted dark blue to blend in with the painted base (not the usual Japanning) with “STANLEY HANDYMAN H104” embossed/stenciled in red or white on the tote and “MADE IN USA” in the bottom casting. The rear tote is somewhat awkward to the feel and definitely not of the caliber of top of the line Stanleys. Another interesting refinement can be found under the the front knob — three little spurs cast in at 120 degrees apart around the perimeter of the indented knob seat — presumably to prevent the knob from rotating. This was an unusual detail usually reserved for higher end planes and backs up Blanchard’s allusion to this plane possibly being developed as a higher end plane and then being downgraded to the Handyman line. The bottom casting is an excellent example of integral-base-casting and Frog “pillar” or “tower”with a raised boss around the tote and lateral brace ribs near the mouth that extend from side to side. The base side wall profile has a more modernistic look with rounded corners unlike the traditional curves you see on other planes. (This was likely a cost saving measure). The toe of the casting has the usual shallow curvature, but the heel has a blunted, almost squared off edge. Behind the frog a letter ‘U’ is cast and a ‘2’ is cast near the throat — presumably foundry casting numbers. The H104, although shorter, in profile looks vaguely like the Stanley No. 62 low angle plane, except for the side wall treatment and different bed angle — 40 vs 12 degrees. After sharpening and honing the blade at 25 degrees with a micro bevel at 30 degrees we were ready to make a few trial shavings. The plane was applied to pieces of 3/4″ x 6″ x 12″ of Pine, Butternut, Hard Maple, Soft Maple, White Oak, Red Oak, Ash and Cherry with honing taking place frequently but not for each wood sample. Skewing the plane was always necessary! Planing was done on two faces — the two long grain edges and finally the two end-grain edges. Planing effort was handicapped without the ability to vary the mouth opening — it is fixed, thus fine shavings were difficult to achieve. A variable mouth opening and more mass would be a significant improvements. Taking into account all of the opposing forces in play as this plane was developed it seems like a great deal of engineering design and manufacturing-engineering went into this presumably low end, and unfortunately low volume plane. 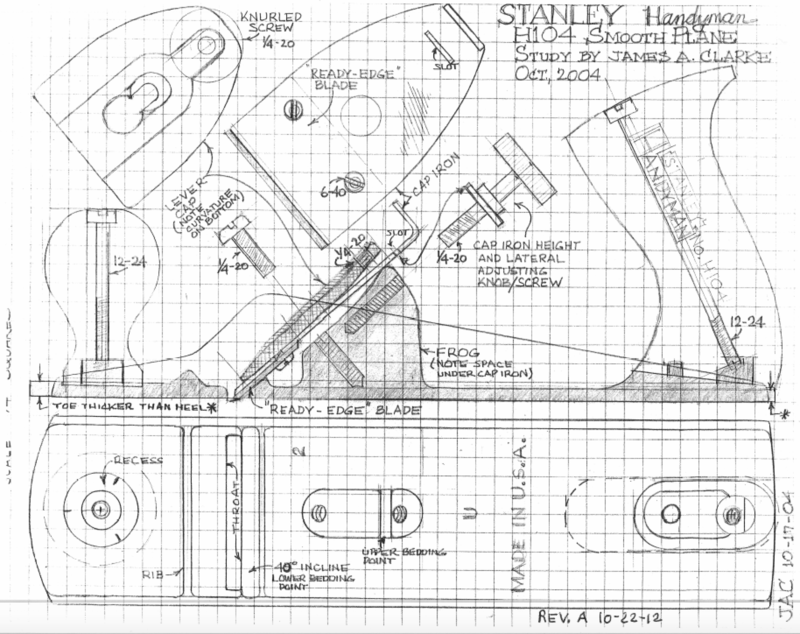 It seems that parallel developments inside of Stanley and economic forces from outside forced them to release this plane into the “Handyman” line even if it was originally intended to be a higher end offering. Nonetheless this plane inherited some subtle levels of engineering excellence that often go overlooked when compared to its higher end brethren. It’s unfortunate that the times (economic and technological change — moving to power equipment) lead to an early demise for this tool — in another time it may have seen a lot more use and wider adoption. Approximate value — $75-$150 (Higher if in excellent condition and with box). I would like to thank fellow member of the WNYATCA Club (Wester New York Antique Tool Collector’s Association) Tim Rhubart for bringing this little ‘gem’ to the light of day. If it wasn’t for that, this author might never have known or become interested in the H104 since it’s not on everyone’s radar as a need to have collectible. Tim agreed to sell it to me for a reasonable price, and with some preliminary observations it appeared to have a story that needed to be told, and thus here in this post. This writeup is dedicated to Tim, my “favorite tool dealer” and friend for bringing it to my attention and the “giants” of research — Roger K. Smith, Alvin Sellens, John Walter, Clarence Blanchard, Patrick Leach, Bob Kaune, David Heckel and several others — although they are not all necessarily students of the “Handyman” line, their methods and approach to research on the study of planes has greatly influenced this author’s modest efforts. A big thank you to my friend James A. Clarke for sharing this material with me and allowing me to share it with everyone online via the post. Also a big thank you to Clarence Blanchard for giving me permission to share a copy of his article on the Stanley No. 140/H104 Bench Plane from “Fine Tool Journal”, Vol 53, No.2 Fall ’03 here. Previous PostModern Make-DosNext PostCalvin Cobb: Radio Woodworker! Where did the time go! After so many years between replacement I guess I am due new cutting blades. The search for same was what led me to this site. To be sure quite a comprehensive discussion and with sketches. Before I go out and pick up a new plane I will search further. But judging by the small production amount and the time elapsed I am pretty sure it will be futile. Might be time to update for a more modern and possibly better one anyway. Thanks very much for the interesting details. blade shows behind cap iron with screws on front but the blade has thru holes and cap iron has the threads to hold the screws. Only noticed while trying to check my blade position since plane doesn’t cut as well as it should. Also a reason for trying to locate new blades. Interesting the lower part of the profile was covered with text, on another viewing it was cleared and revealed a correct depiction of the seating of the blade. The auxiliary view is not in agreement and incorrect. Not a problem just an observation.